Below are some photos taken in the days leading up to Dora's rescue and return to rehab on Wednesday, April 4. 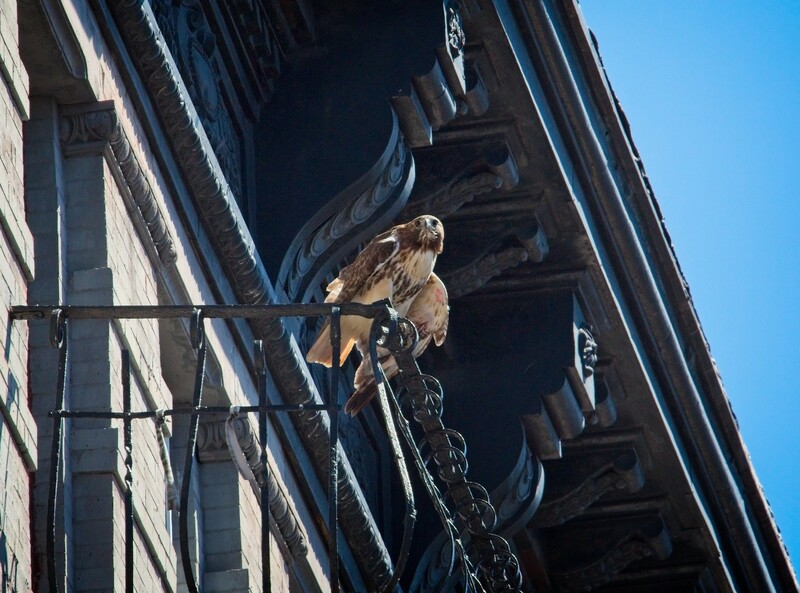 On Saturday, March 31, Dora was restless, flying from tree to tree, and hopping around on fire escapes on E 8th Street. 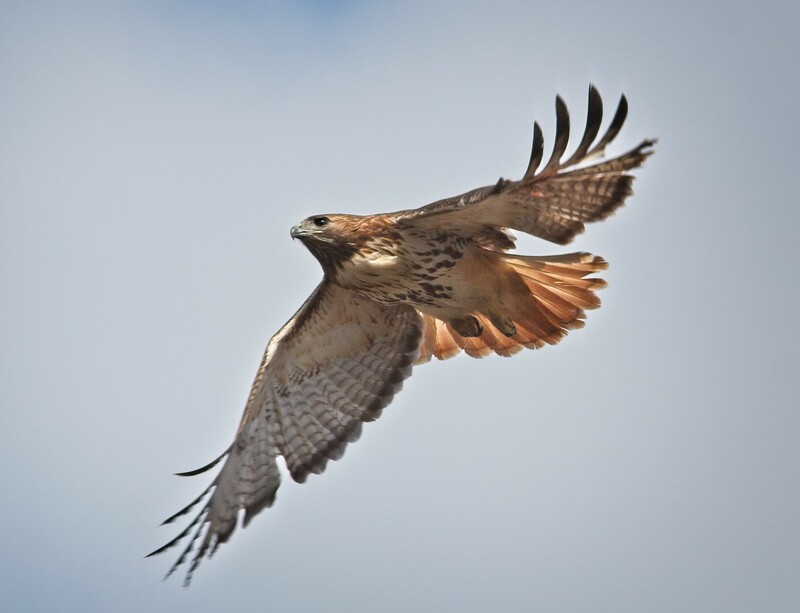 When she took off, we could see a broken blood feather dangling from her left wing. This was causing some bleeding and probably bothered her, but she was still able to fly. In the early afternoon, Dora settled down in the nest and was very calm the rest of the day, so we wondered if she could have laid an egg. However, she went to roost that night on a fire escape, so that would indicate no eggs in the nest. 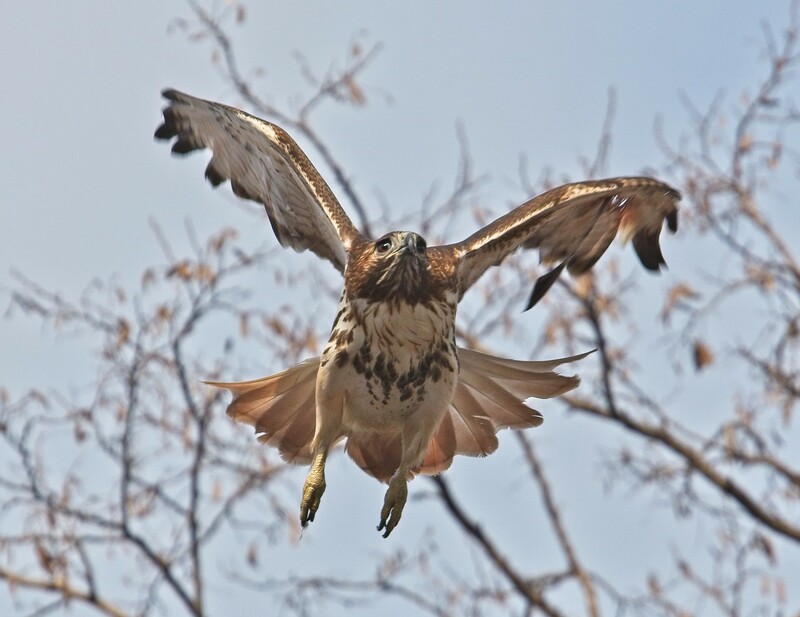 On Sunday, April 1, Dora was again restlessly flying from branch to branch in the trees surrounding the nest. 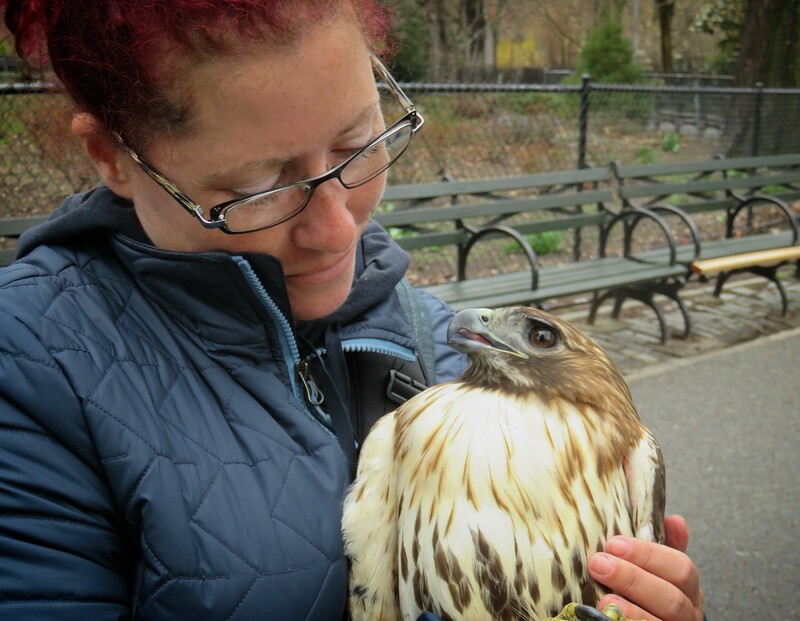 Christo spent a lot of time with her and they kept on mating, even on the roof of St Brigid's church (on Easter!). Below, Christo is on the left and Dora is on the right. Dora was up in the nest a lot, but was sitting up on the sides, not hunkered down inside it, as she would do to brood eggs. 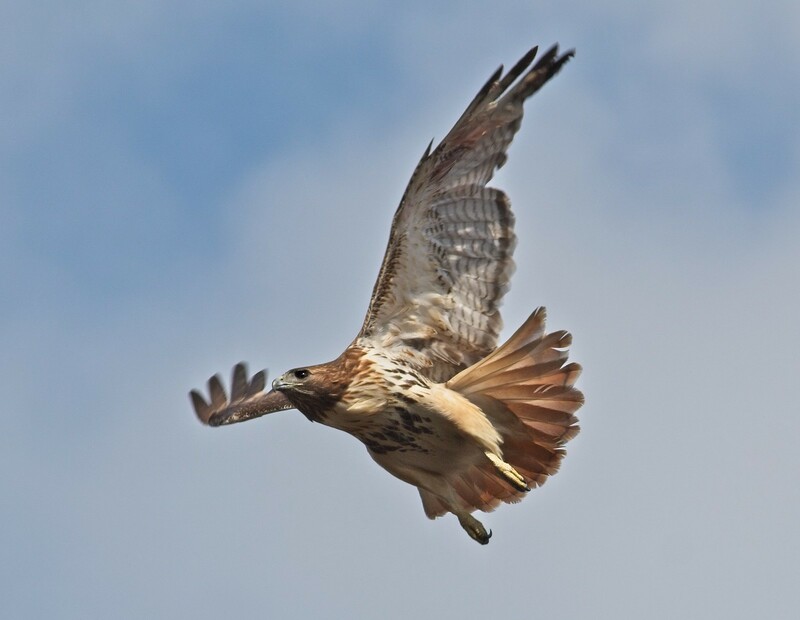 The bleeding from the broken feather appeared to have stopped and her flying looked all right. She and Christo spent several hours of the afternoon perched on a Village View building at First Avenue and 4th Street. I passed through the park Sunday night at 9:40pm and I could see a hawk sitting up in the nest, but couldn't tell if it was Christo or Dora. For the last few weeks, Christo has been in the nest at nightfall to ward off squirrels who keep trying to get into the nest. 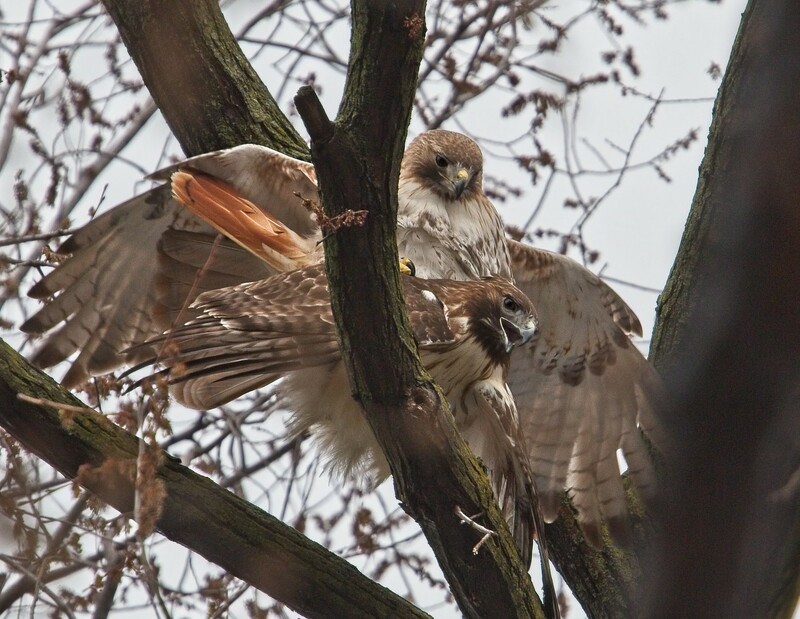 Monday morning saw Dora get into a fight with another hawk. 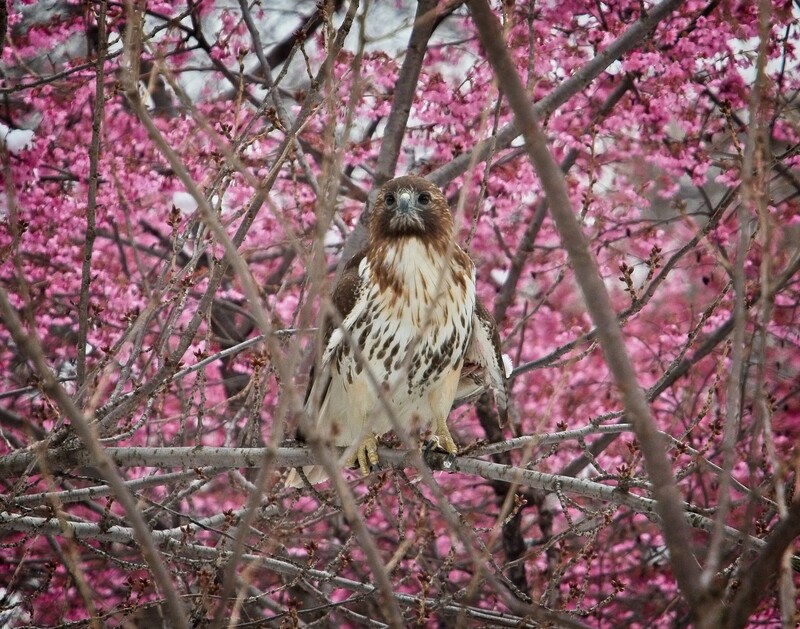 I arrived in the park soon afterwards and found her perched low in a cherry tree on the east side of the park. 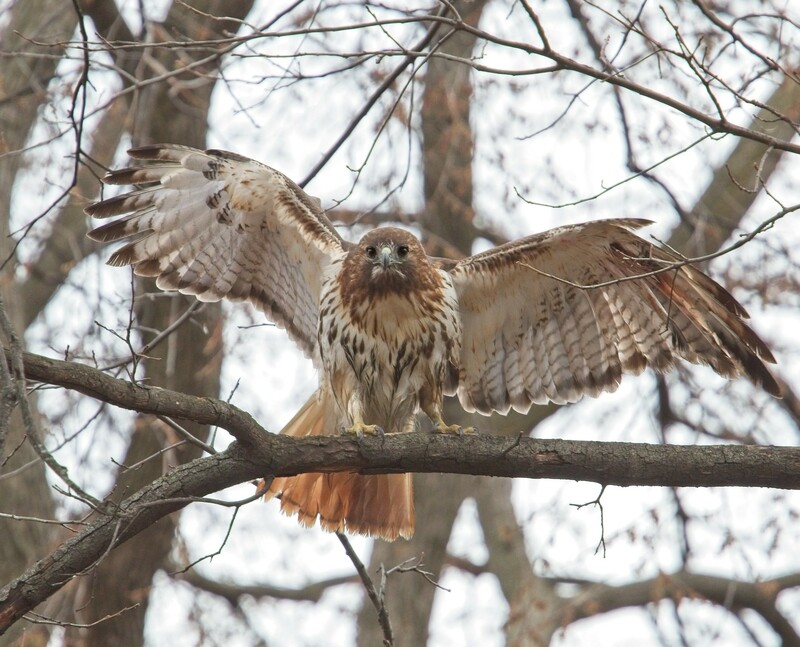 She stayed low for some time and gave us a scare when she teetered on a tiny branch that hung right over the intersection of Avenue B and 9th Street. 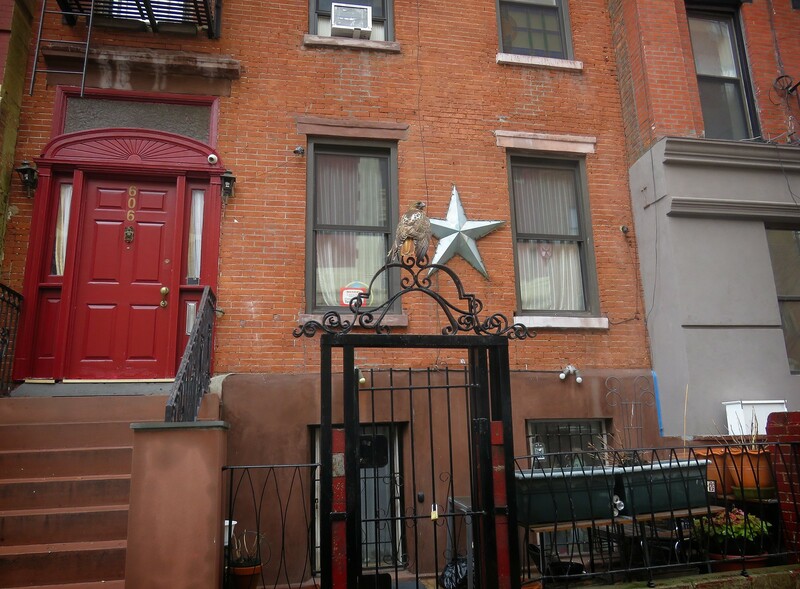 The NYC Urban Park Rangers were called in, but by the time they arrived, Dora had flow to a higher tree near the dog run and seemed to be recovering herself. By afternoon, she was back to flying around. 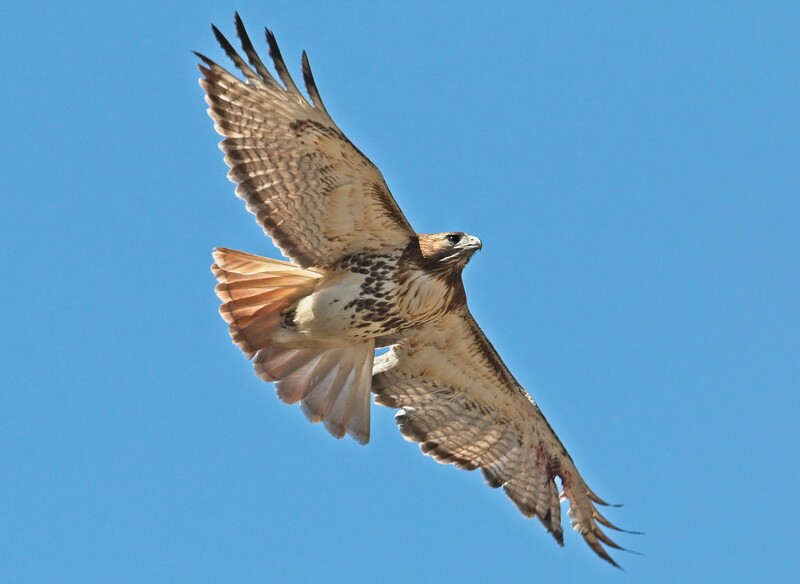 In the photo below, you can see the broken feather that was still hanging from her left wing. Tuesday, April 3 was a miserably wet and cold day. 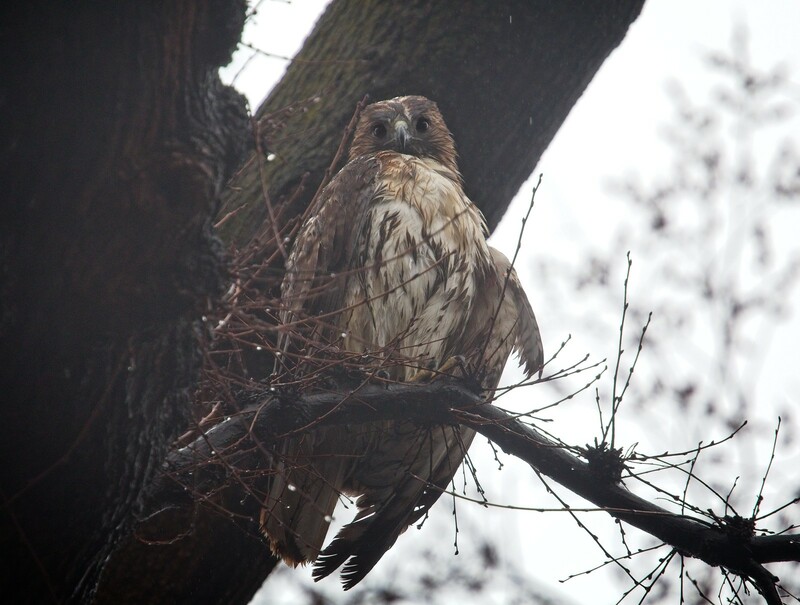 When I arrived in the park at noon, Dora was down in the nest in brooding posture. I was really happy to see that. At 2pm, Christo flew in and he started brooding, so this confirmed in my mind that they had eggs. 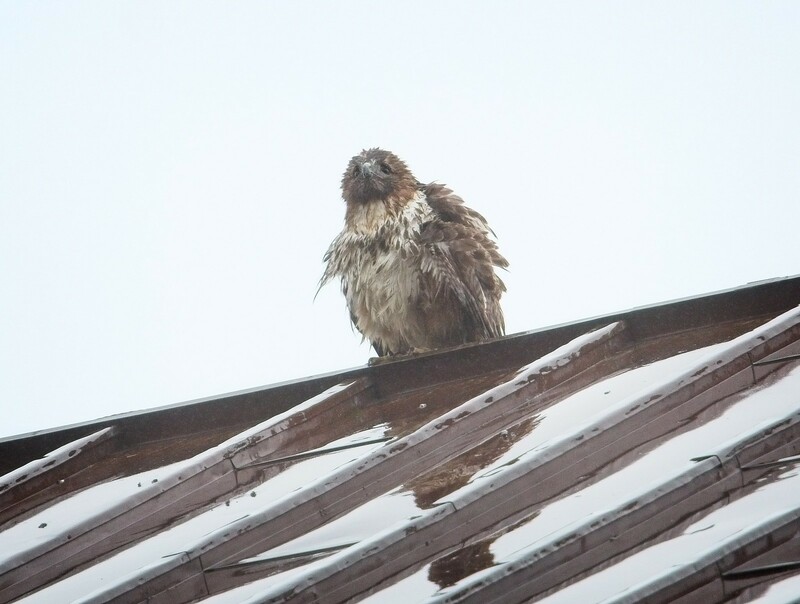 Dora flew to the roof of St Brigid's where she took advantage of the rain and had a shower. 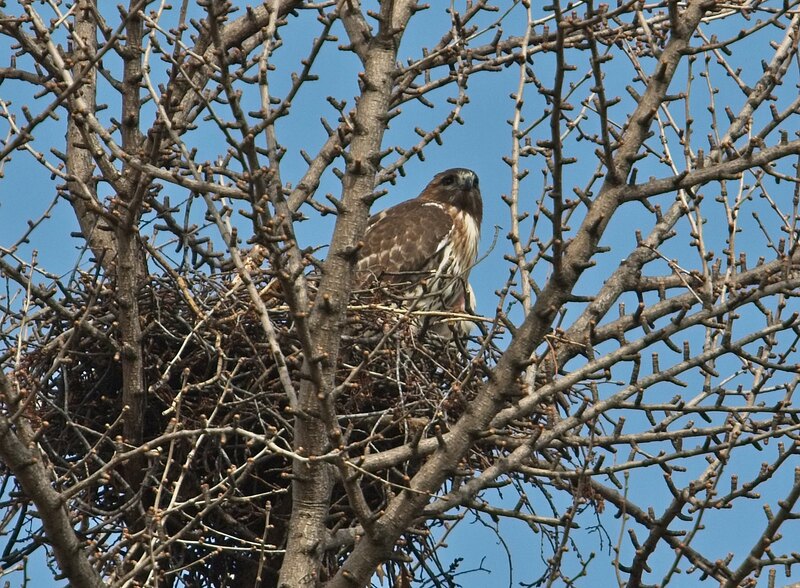 After an hour on the roof, Dora flew back to the park and sat low in a tree for the next four hours. Other than looking wet, I couldn't tell how she was feeling. I was glad she was staying still and resting, but also concerned that she hadn't gone back to the nest yet. 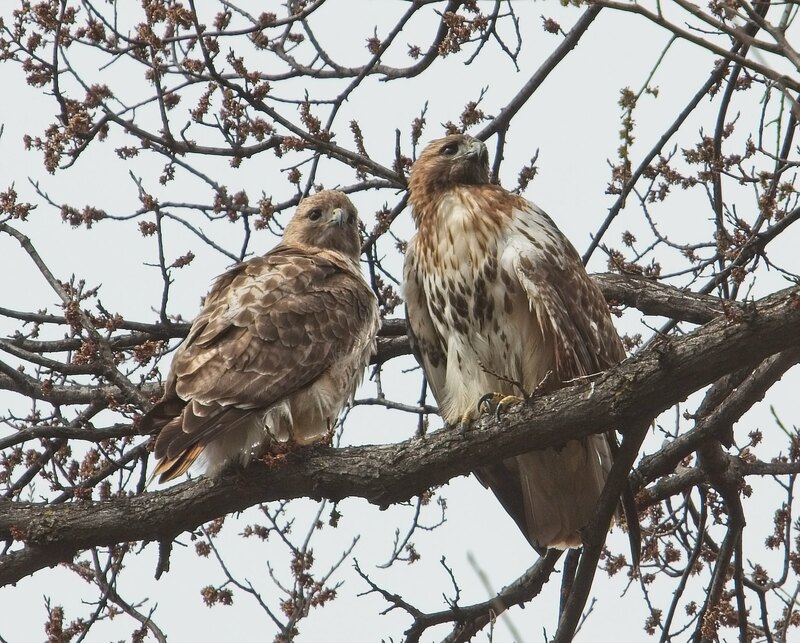 Christo came out three times to mate with her, but he returned to the nest to brood each time. 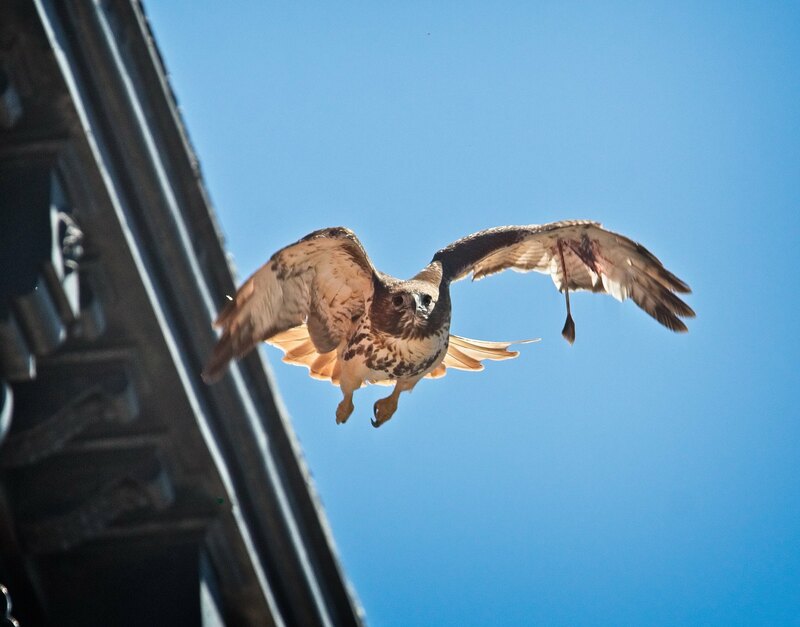 At 7:20pm that evening, Dora flew to a fire escape on E 9th Street to roost, which really disappointed me as she should have gone back to the nest. As I'd been following her, I lost track of Christo, so I don't know if he stayed in the nest overnight. It would be unusual for the male to do that, but I've seen him in the nest after dark for several weeks, and he has always been an extraordinary hawk, so it wouldn't surprise me if he did brood eggs overnight. I really don't know, though. Wednesday morning is when we got the call Dora was low on a gate (below) and the rest of the story of that day can be read in my previous post. In this video taken by Mark Cyr on Wednesday, Bobby Horvath from Wildlife in Need of Rescue and Rehabilitation (WINORR) examines Dora's wing and discusses her broken feather. You can see many more photos of Dora on my Flickr page.